DOC area for a famous dessert wine named after the Portuguese island of Madeira. The archipelago is located in the Atlantic, about 1,000 km from the mainland Portugal and 650 km from the coast of Africa ( Morocco ) away. It was discovered in 1420 by sailor João Gonçalves Zarco (1380-1467), who found a densely forested island (Madeira means "island of the forest"). The Portuguese set the island on fire, the fire raged for seven years. As a result, almost all the vegetation was destroyed, but the wood ash and the already existing volcanic soil created ideal conditions for viticulture. At the end of the 16th century, a commercially important viticulture is documented. The port of Funchal quickly developed into a strategically important stopover, taking all the ships en route to Africa. Asia and South America were headed. Here, the ships were also supplied with wines. These spoiled but mostly on the long sea voyages. That's why it gradually took over Spriten with brandy distilled from sugar cane to make especially the wines more durable. But this became the norm only in the middle of the 18th century. It is not certain, when a Madeira of today's kind existed, but a legend tells of it from the year 1478. In that year George Plantaganet became Duke of Clarence (1449-1478), brother of the English King Edward IV (1442 -1483), sentenced to death for conspiratorial activity, greed and violence. He was left with the choice of execution and, according to unsecured tradition, he was supposed to settle for death by drowning in one Malmsey filled barrel in the tower. But maybe the "drowning" refers to the fact that he was a heavy drinker all his life. At any rate, he was not killed by the beheading of decapitators, which proves a later exhumation. The special kind of production, which concerning the typical taste and the colour also as maderisation In the 17th century, by chance, large quantities of Funchal were reported to have been shipped by ship Dutch were exported to South America and other colonies. It was found that the longer the journey took and the longer the ship stayed in hot, tropical climates, the better the wine became. The rocking ship movement (as was then thought) but especially the extreme temperature fluctuations contributed to the typical taste. That's why they loaded many ships with the wine and sent them to the East Indies and back just for manufacturing purposes (they crossed the Equator twice). The wines were called "Vinhos de torna-viagem "(Wines make a journey) or" Vinho da roda "(roda = circulation) and is also on old Madeira bottles on the label documented (TVE). There are still such old wines. The original impulse for trade in Madeira was laid in the late 17th century, when large quantities of wine were needed for the new Portuguese colonies in South America (Brazil). By the colonization of America in the 17th century under the reign of the English King Charles II (1630-1685) Madeira was also on the North American East Coast in fashion. He enjoyed a great reputation there and became a coveted and expensive object. The American Declaration of Independence in 1776 was solemnly sealed with a Madeira. The first US President George Washington (1732-1799) enjoyed a Madeira dinner every day. And the founding of the named after him capital Washington DC was also celebrated with a Madeira. In the 19th century, the wine was in the USA so popular that own events (Madeira parties) were held and clubs were founded (legendary is the still existing Madeira Club of Savannah-Ohio). The elaborate production by boat trip was practiced until the beginning of the 20th century, but then abandoned (individual bottles are still available in stores). One tried now to imitate the special conditions. There were wine storage (port Estufa = oven, English Hothouse) built, this provided with solar heat-saving metal roofs and stored the wine for months at high temperatures. This was the beginning of today's Estufagem process. In the 1860s reached the mildew and the phylloxera the island and paralyzed the viticulture. In the 1870s many vineyards were replaced by sugar cane, only just under 500 acres remained. Ten years later, a new beginning with unedited ones was ventured hybrids (especially Cunningham and Jacquet ). For the Madeira, these were banned in 1979. The conditions are set and monitored by the IVBAM (Instituto do Vinho, Bordade and Artesanato da Madeira), which also operates a museum. The traditional four noble grape varieties from which the best wines are produced (85% pure) are Boal (Bual) Malvasia Branca de São Jorge (Malmsey) Sercial and Verdelho, Only in small quantities there is the variety Terrantez, In the vineyards with about 2,100 hectares of vineyards, which are managed by about 4,000 wine growers, but dominated with 80% Tinta Negra Mole ( Negramoll ). The vines are traditionally at low pergolas on terraces drawn so that the grape harvest must be laboriously bent or kneeling. The grapes are then ground. The fermentation is carried out in 25,000-liter containers made of wood or coated concrete, in the Madeira types Malvasia and Boal mostly by means of maceration, in the types Sercial and Verdelho the must is separated from the peels before. Wines from Sercial and Verdelho are usually fermented dry. For wines from Malvasia takes place early and in those from Boal after half of the fermentation a stopping by 96 percent Aguardente (Spirits). The manufacturing technique Estufagem is almost exclusively used in Madeira and makes it unmistakable. This is the heating of the wine that he used to be exposed to during his voyages across the equator in natural form. For mass production huge, tiled concrete tanks with 20,000 to 50,000 liters volume are used. Through this runs a hot water flowing through the heating coil made of stainless steel, which heats the wine for at least three to six months at 40 to 50 ° C.
In the second, much more elaborate but more gentle way, the wine is filled in the typical 600-liter barrels (lodge pipes) and stored in heated rooms at slightly lower temperatures. In this case, it is usually six to twelve months. Some producers refuse to artificially heat the wine. They store the barrels under the roofs of the lodges in the Canteiros (Storage racks for the barrels), where they are stored naturally heated by the sun, are cooled down at night and are therefore exposed to the other variants extreme temperature fluctuations. The wines, matured in this traditional way on the island (not by ship), were formerly known as "Vinho canteiro". In all cases, by heating the sugar contained in part caramelized, The wine gets the typical taste and strong oxidation the Madeira clay. After the Estufagem (heating), the wine must be cooled gently. The age of the wines is calculated from the end of the Estufagem phase. Obligatory is that Spriten Depending on the type of fermentation described above, some wines will be brewed for the first time at this time, with sweet wines this may be the second or third time. This achieves an alcohol content of around 17% vol. The Sweet Madeira has two varieties of sweetener. For the better wines, this is done by the mentioned fermentation interruption, in the cheaper thickened Süßmost (Vinho Surdo) is added after fermentation and this also color by the addition of caramel corrected. After filtration The wine rests for 12 to 18 months and is then classified in terms of quality. After this racking in wooden barrels, the further maturation takes place. From Estufagem these are at least three years, these are called "Finest" or "3-year-old". A "Seleccionado" is at least three years old, but not more than five years old. An "alvada" is an at least 5-year blend of several varieties marketed in 0.5-liter bottles. The minimum age for wines from the noble varieties is five years, that is the "reserve" or "5-year-old". From "Special Reserve" or "10-Year-Old" the good wines start. Other aging levels are "Extra Reserve" or "Over 15 Years Old", "20 Years Old", "30 Years Old" and "Over 40 Years Old". 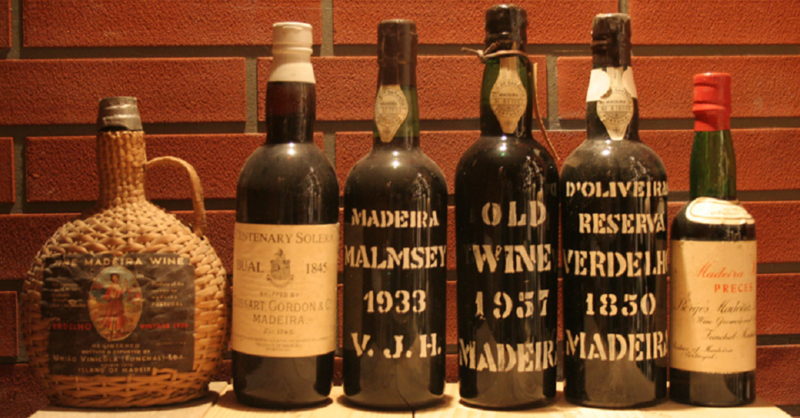 The finest are the "vintage Madeira", which ripen at least 20 years in the barrel and two years in the bottle. In all variants, a Madeira is immediately edible when it comes on sale. Madeira develops (for example, opposite port wine ) much less depot, on decanting must (if at all) be done only with very old wines. It is considered to be the most durable wine in the world, which will continue to improve as it ages. On the market today (extremely expensive) vintages from the end of the 19th and beginning of the 20th Century are offered, which have no indulgence impairment. Even an open bottle is almost unlimited shelf life. The type of wine is produced only a few years and corresponds to the colheita at the port wine, He becomes at least 85% of the same vintage and at least 85% from just one of the recommended or approved grape varieties. The wine matures for at least five to a maximum of twenty years. The label indicates the year in which the Solera "Opened" (started) was. This means that in addition to the specified vintage due to the vintage blend also younger vintages are included. The system introduced here only in the 19th century (as in the sherry ) is hardly used anymore in Madeira. This genuine vintage wine comes to 100% one vintage, He matures at least 20 years in the barrel and two years in the bottle. A new type of wine is "Harvest Vintage" with 5 to 10 years maturation, which is not necessarily suitable for extended storage over decades. The names of the four noble grape varieties, as well as the rare variety Terrantez appear on the label and also stand for a certain Madeira style or content of residual sugar. These three types of wine from the same grape varieties are, if ever, produced only in the smallest quantities. A Moscatel Madeira was last produced in 1900. Older vintages of Terrantez achieve Auctions regular fantasy prices, the 1789 vintage and especially the 1795 produced by Barbeito are legendary. There are efforts to revive the Terrantez or this Madeira style. This variety is used to produce simple Madeira, which account for about 40% of production. The name may not be on the label appear. These wines are referred to only with the degree of sweetness. The Weintypl is much darker and sweeter like Sercial or Verdelho. The variety is grown mainly on the warmer south side of the island. The golden wine has a characteristic raisins and dried fruit aroma with a fresh acidity even in old age. The sweetest and most complex type of Madeira is considered the very best. The red and white Malvasia grow in the lowest and warmest areas of the island (especially around Câmara de Lobos). The luscious wine with a honey, Coffee- and Caramel flavor still tastes not sticky due to a concise and balancing acidity. This wine is a hundred years and longer lasting. The driest and acidic in the youth and astringent Wine type with pale color. The grape variety of the same name is usually grown in the cooler altitudes and on the north side of the island and therefore rarely matures. After aging for at least ten years, an almond-like aroma develops. The wine type has a bittersweet, nutty flavor. The eponymous variety is grown on the north side of the island, but comes to better maturity as the Sercial. Even in old age, a spicy acid remains, the golden yellow color develops from golden yellow to a darker tone. This particular type of wine can also be described as a milder and lighter Verdelho. There are several variants of the name of this at least historically interesting wine. One states that he was vinified from vines, where no artificial irrigation possible and thus a dependence on rainwater was given. The second variant reports that in the 18th century on the sea route to America several Madeira barrels were exposed to rain for a long time, the water was absorbed by the wood and got into the wine. As intentional "inventor" but also an American called Habisham is called. In the US, one found in any case pleased with this semi-dry, light wine, which became an export hit. The type was produced for 200 years, for example by Cossart Gordon, Today it is produced only in small quantities, mostly from the Tinta Negra Mole. However, the manufacturing method is only vaguely defined. This page was last modified at 14 July 2018 at 07:03.